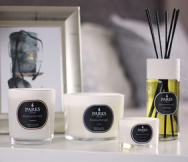 The Parks Candles 30cl Frankincense candle is, of course, the perfect holiday-themed gift, but this pure, hand-poured aromatherapy grade candle also works to promote the body’s natural immune response, and is understood to reduce stress, anxiety and even the pain of chronic inflammatory diseases, like arthritis by aromatherapists. Frankincense is perhaps best known as one of the three gifts given to Jesus by the Three Wise Men – the ‘gifts of the Magi’ – and it is, therefore, linked to the holiday traditions of many different peoples. Frankincense has been a sought-after trade good for more than 5,000 years and images of the potent resin even adorn the tombs of many Egyptian Pharaohs. It has been called many things over the millennia, including olibanum, dhoop, al-lubān and, of course, "franc encens", which means ‘high-quality perfume or incense’ in Old French. Frankincense (the resin of several species of Boswellia trees) has long been used as a traditional medicine, often being chewed like gum across Africa and Asia, where it was believed to aid digestion and support healthy skin. Ayurvedic medicine used frankincense to purify the air, treat arthritis and support female hormones. The genuine frankincense oils in our candles are traditionally harvested, purified and then combined with fine 100% natural wax. The wick and wax are both designed to be smoke and soot free, imparting nothing but the purity of the frankincense itself to the air. The result is a beautiful, powerfully scented candle that can burn for as long as 50 continuous hours.